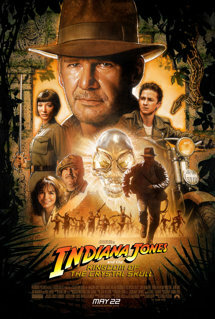 On May 22, Indiana Jones is back in a new globe-trotting adventure, “Indiana Jones and the Kingdom of the Crystal Skull.” Directed by Steven Spielberg and starring Harrison Ford as Indy, “Indiana Jones and the Kingdom of the Crystal Skull” features an outstanding cast, including Oscar winner Cate Blanchett, Karen Allen, Ray Winstone, John Hurt, Oscar winner Jim Broadbent and Shia LaBeouf. Frank Marshall is the film’s producer. George Lucas and Kathleen Kennedy are the executive producers. The screenplay is by David Koepp from a story by George Lucas and Jeff Nathanson.